Helen was found living on the streets of India, starving, dehydrated and suffering from mange. She was so sick she could barely stand up, and didn’t even look like a dog at all. It seemed she had given up hope — until someone finally noticed her. Animal Aid Unlimited, a rescue organization in India, got a call about Helen and immediately went out to find her. When rescuers found her, she was weak and defeated, barely able to lift her head to greet them. 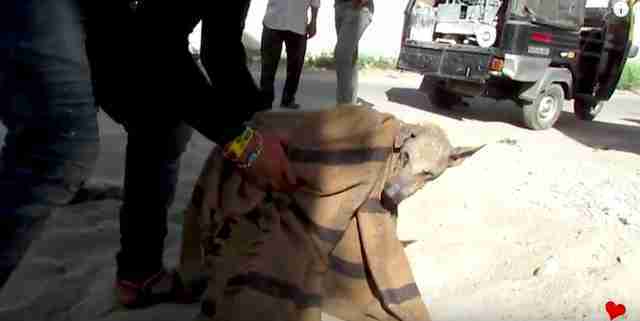 They offered her a bit of food to gain her trust, and then covered her with a blanket in order to lift her away to safety. The sick senior dog was in so much pain that she cried out when her rescuers picked her up, unable to handle even the gentlest touch. … and then eagerly devoured an entire meal. After she was fed, rescuers rubbed Helen down with lotion to help heal her skin, and a few days later, gave her a very gentle bath. She was also given fluids through an IV to help with her dehydration. Even after being fed, cleaned and treated, though, Helen’s spirit still seemed so broken, and rescuers hoped that with a little time and love, she would be able to fully recover and rediscover her love for life. After 10 days in the care of Animal Aid Unlimited, Helen’s personality and will to live began to shine through, and from that moment on, she proved to her rescuers that she wasn’t ready to give up just yet. It took months and months, but now, Helen is completely healed, and looks so insanely different from when she was first found suffering on the street. She may be old, but now that she’s recovered, Helen seems to love life again, and is clearly so grateful to her rescuers for giving her a second chance. To help other animals like Helen, you can donate to Animal Aid Unlimited.